From now until May Three Rivers Market will be hosting Urban Land Scout workshops every other Saturday. You can view a complete list of the workshops and activities here. You must pre-register to attend and there is a small fee to cover the cost of materials ($4 for TRM member-owners, $5 for non-members). You can sign up at the store at the Customer Service desk or over the phone (865-525-2069). While everyone is welcome to join the Urban Land Scouts, these workshops are designed for adults and young adults (5th grade and older). Younger children can attend, but they (and all minors) must be accompanied by a parent or guardian. Please contact me (Katie Ries) with questions: k.ries@threeriversmarket.coop. I look forward to seeing you all at the next workshop. If you don't live in Knoxville and are interested in becoming an Urban Land Scout or starting your own tribe, please be in touch. This past Saturday was the first of ten Urban Land Scout workshops at Three Rivers Market. It was a great group of people: some familiar faces as well as new ones. 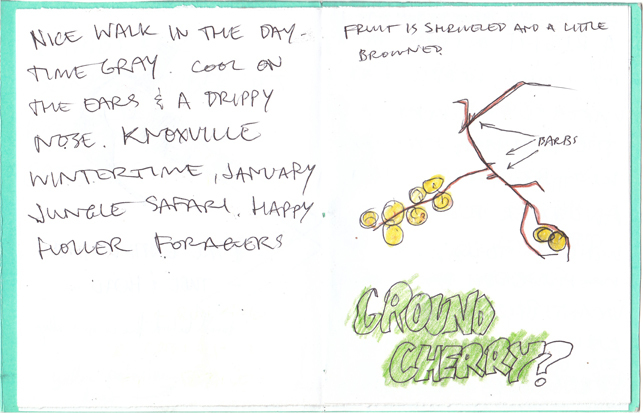 We bound field journals and went for a brief and brisk walk around the neighborhood next to the co-op. After our walk we returned to work in the books noting some of the things we'd seen. Below is an image from my brother's field journal. I look forward to seeing the books filled in with further observations, sketches, and samples. Our next workshop will center around mapping-- both factual and imaginary. Hope to see you all there. I love the things that are revealed in winter. And the variety of plants that thrive in it. Like moss and mushrooms. Here's an example of both growing in a Knoxville city park. Every time I see the bright green velvet fuzz of moss in winter I get inspired anew to try to cultivate it for my very own. Two years ago I found many recipes online for "moss graffiti" and tried to whip some up. The general idea is to blend pieces of moss (and spores) with some yeast (as found in buttermilk or yogurt), liquid (beer or water), and sugar (to feed the yeast?). Moss, it turns out, is not something one can "whip up." After you make and apply the mixture, you will need to tend the site to ensure it doesn't dry out. There is a folk rule that says you can find north by looking to see on which side of trees the moss grows. This is not an accurate or reliable way to find north, but refers to the fact that north-facing sites (or sides of things) will be better shaded and thus more protective for moss, spontaneous or otherwise, and other shade-loving plants. In the course of my moss experimenting I tried to inoculate a paper letter R and instead grew, almost overnight, this fuzzy gray mold. Surprise! Let 2012 be full of such happy accidents and unexpected forms for all of us. Let us be open to what is more often than what is expected. 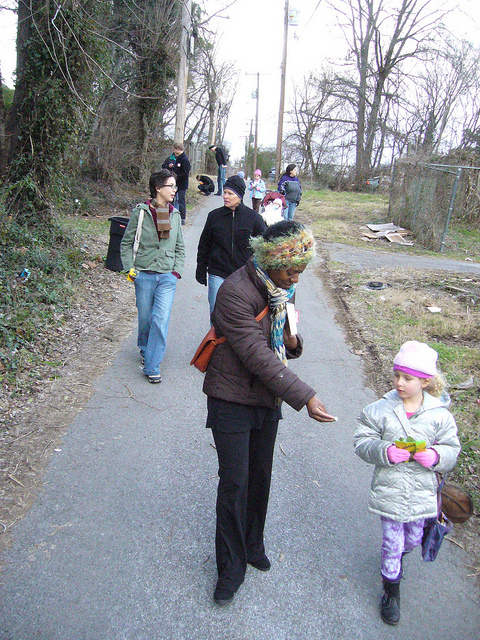 This month the Urban Land Scouts are beginning a series of ten meetings at Three Rivers Market, a cooperatively-owned natural foods grocery store in Knoxville, TN (and where I work as the Outreach and Marketing Director). 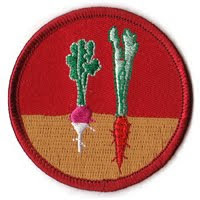 We will be meeting every other week for the next five months to work on earning badges for each of the ten Urban Land Scout values. Three Rivers Market (TRM) and the surrounding area will be a good area to scout about: it sits near the top of one of the hills framing Happy Holler and between an historic old neighborhood and I-275. I am also excited to meet and learn from TRM's community of member-owners, many of whom I expect are already Land Scouts in their own rights. Our first ULS meeting will be Saturday, January 14th, from 3-5 pm at TRM. There is a small fee to attend: $4 for member-owners of TRM and $5 for non-members. This will cover the cost of materials. You can sign up at TRM's Customer Service desk (on the left as you enter the store). The meetings are open to adults and responsible young adults (5th grade and older). We will begin on the 14th by binding small field journals similar to the ones we made at Beardsley Farm and the Nashville Food Project. I like this form for a number of reasons: it can be made with minimal and varied materials, is simple to construct, easy to modify, and small enough to fit into most adult-sized back pockets. Most importantly, a sketchbook or field journal like this is a helpful tool in beginning a practice of daily observation and attention, the root of Land Scouting. If you live in or near Knoxville, I encourage you to come out and join us. Dress for the weather.